In this article we will introduce the holiday spots loved by celebrities such as Bill Gates, Warren Buffett, Mark Zuckerberg, and other extremely wealthy people who own real estate around the world. The super rich seem to be fascinated by small islands with moderate climates and small populations at which they can forget their busy daily lives and enjoy private time in a slow-paced environment. In the Asian region, Bali’s popularity is deep-seated. 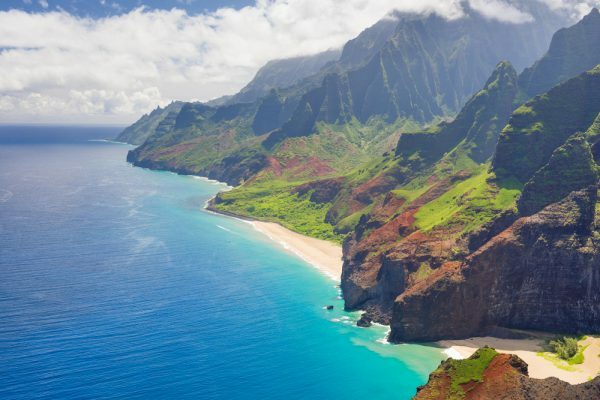 The island of Kauai is located in the central Hawaiian Pacific. It is a small island blessed with beautiful nature and is known to be the oldest of the Hawaiian Islands. Facebook’s Mark Zuckerberg purchased farms and the North Shore for $66 million in 2014. It seems that Zuckerberg really enjoyed the Kauai Island as he later acquired a Pila’a Beach farmhouse for $49.6 million as well. However, he faces endless conflicts with the local residents over land rights and the appearance factor. In 2016, Hollywood actress Julia Roberts’ villa was bought by US film director Mike Fleiss for $16.2 million. Larry Ellison, the founder of Oracle Corporation, is fond of a similar small Hawaiian island called Lanai Island and invested $300 million in purchasing 98% of it. Because it contains 90,000 acres of land, a city with a population of 3,200 people, and two luxury resorts including the “Four Seasons Resort Lanai”, its massive scale is surprising (article from NBC, November 14, 2017). It is on this island that Bill and Melinda Gates had their wedding ceremony in 1994. Palm Beach in Florida is famous for the resort property owned by President Trump. Trump purchased America’s most expensive Merriweather Post residence for $5 million in 1985. He then invested $3 million in converting it into a private club called the ‘Mar a Lago’ in 1995. The fee for the ‘Mar a Lago’ doubled after Trump was elected into office as president of the United States. According to reports from CNBC, the entry fee is $200,000 plus a required annual fee of $14,000 (+ tax). Warren Buffett owns a mansion in a holiday resort area in California that is popular among the wealthy. The factor that makes this property different from many other rich holiday homes is that he bought it for a mere 15,000 dollars in 1971. As of 2017, it is being sold for $11 million. According to a February 28th, 2018 Business Insider article, $15,000 in 1971 is currently equivalent to $934,000. Even with inflation taken into account, due to the selling price being more than 11 times its original value, the property has yet to be sold even after one year. Billionaires such as Elon Musk, the CEO of Tesla, and real estate king Tom Gore own villas in Laguna Beach (article from yolandaslittleblackbook.com, November 3, 2016). The tourist attraction of Skradinski Buk is a dynamic waterfall that flows through the beautiful nature of the Croatian port city of Skradin. Hvar Island, on the other hand, is a popular resort island in the Adriatic Sea. Bill Gates seems to regularly visit Skradin and Hvar in order to relax (article from ABC News, May 6, 2017). Richard Branson, the founder of the Virgin Group, purchased the entirety of Necker Island. You can enjoy a private experience without worrying about the paparazzi or the prying eyes of others. Branson has also opened Necker Island to the public and allows people to enjoy various types of entertainment and events, such as lodgings and marine sports, wedding ceremonies, spa treatments, and parties. The price is given out through inquiry, but according to information from ABC News, it is said to be $5,000 per night. Telluride in Colorado is not just a beach resort area favored by the wealthy. It is praised as “a hidden gem in the Rocky Mountains” that is crowded with wealthy skiers. Former Hewlett-Packard CEO Meg Whitman owns apartments in Telluride that are used as ski resorts as well as several hundred acres of land. Tom Cruise tried to sell the villa he owns there for $59 million in 2016, but was unable to find a buyer and seems to have given up its sale. Ralph Lauren, an international fashion designer, also owns a property there. The Hamptons are a popular resort area that is built in the South Fork of Long Island, New York. Hillary Clinton, who campaigned for the 2016 presidential election is also known for having lived in a luxurious villa in The Hamptons with her family. The rental fee for a 2 week stay is $100,000, a price ordinary people cannot touch. Beyonce and Jay Z together have a total net worth of $1.255 billion. The mansion they purchased there in 2017 was slightly less than $26 million. Bali’s resort area has been popular among celebrities and wealthy people for many years. Musicians John Legend and Chrissy Teigen, former President Obama, and supermodel Ashley Graham visited the island in 2017 on vacation.